A delicious condiment staple of French cuisine. 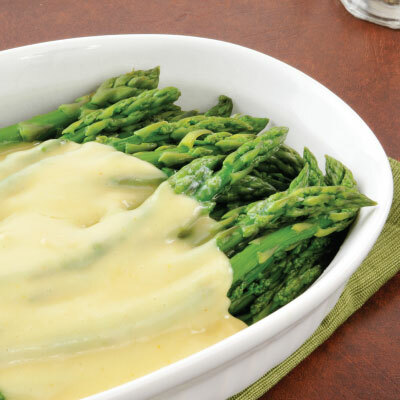 Béarnaise sauce is incredibly versatile, subtle shallot, tarragon and peppercorn flavours in this creamy creation, pair well over vegetables and meats. Serve warm over fish or grilled meats. Mix together the DYC White Wine Vinegar, white wine, shallot, tarragon and peppercorns in a small saucepan. Simmer over a medium heat until it is reduced to about 1 tablespoon of liquid. When cool, strain this liquid and set aside. In the top of a double boiler, over hot but not boiling water, whisk together the water and egg yolks until they start to thicken. Whisk in the vinegar mixture. Begin adding the butter cubes one at a time. Make sure it is fully mixed into the sauce before adding the next piece. The sauce is ready when all the butter has been added. Stir in the salt and freshly chopped herbs just before serving.